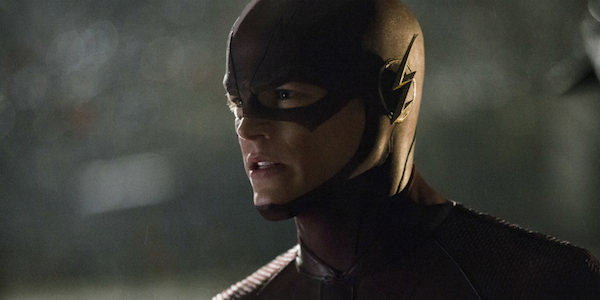 Did The Flash Just Hint At A Major Comic Book Storyline? Warning: major spoilers ahead for the Season 2 finale of The Flash. Season 2 of The Flash has seen Barry and Team Flash mess with time travel in some big ways, and they haven’t always been particularly responsible about it. Now, the finale has shown that the time travel shenanigans that have introduced everything from speedster doubles to time wraiths have culminated in Barry crossing a major line. He went back in time and stopped Reverse Flash from killing his mom all those years ago. Now, Barry has opened up a whole new timeline in which his mom is alive, which might be a not-so-small hint that the show will take on the acclaimed "Flashpoint" comic book arc. The Season 1 finale saw Barry make the heartbreaking decision that saving his mother wasn’t worth all the unknowable changes that he could inflict on the world. His future self even took the time to warn against saving his/their mom, but now the pain and loss of the death of Henry Allen has motivated Barry to save Nora Allen. "Flashpoint” follows a world in which Barry Allen traveled back in time and changed one tiny detail of the past by saving his mom, which wrought huge changes for the future and twisted it into something unrecognizable. Some heroes became villains while other heroes never even came to be, and Barry had memories of everything. Most of the heroes who played huge parts in “Flashpoint” don’t actually exist in the Flarrow-verse at this point - there’s no Superman or Batman or Cyborg in play, to namecheck a few - so the story would obviously change a lot in adaptation no matter how The Flash plays things. The Flash will have to get creative to show just how big a line Barry crossed by changing the timeline, and do it without messing up the other shows in the Flarrow-verse. The Flash may be able to borrow characters from Arrow and Legends of Tomorrow and possibly even Supergirl to create an alternate world to all kinds of crazy “Flashpoint”-inspired plots that could fit into the DC mythology on The CW. The Flash actually dropped what could have been a "Flashpoint" Easter egg earlier in Season 2. Just as the Batman of the "Flashpoint" Earth was actually Thomas Wayne (because it had been Bruce who had died in the alleyway), the Green Arrow of another Flarrow-verse Earth was actually Robert Queen, whose son Oliver had drowned when their yacht went down. Assuming that Arrow characters can be used for Batman, perhaps the addition of Supergirl to The CW means that "Flashpoint" Superman will get a proxy as well. The Legends of Tomorrow lineup seems to pluck heroes from all corners of DC lore, so a Flash "Flashpoint" could actually be truly remarkable on the small screen. Hopefully, The CW can pull it off in a way that honors all four of its DC shows while giving Barry a chance to fix what he may have broken. Only time will tell what The Flash has in store in Season 3 next fall. Check out our breakdown of what we know so far to see what confirmed to be coming next season.